Special Police Sergeant Chris Pope was deliberately hit with a Quad bike on Alfred Rose park on Saturday Night. He is currently recovering in Stoke Mandeville Hospital after both bones were broken in his leg. Sources have told the Bucks Herald that Thames Valley police have arrested a suspect. Special Sergeant Pope made an emergency call for assistance after the incident, with a full response from the MPAS Helicopter, Road Units and Dogs dispatched to the popular park to apprehend the subject. A statement posted on UK Cop humour has already amassed 1,200 liked with messages of support for Special Constable Chris Pope. "Specials Sergeant Chris Pope from Thames Valley Police Team 3 based at Aylesbury was deliberately run over by a quad bike on Saturday night. "While on patrol dealing with an ASB issue of a motorbike speeding round a park a quad bike was driven at S/SGT Pope on purpose. He was thrown into the air and suffered a left broken leg. Shift, RP, Dog and NPAS all responded to his call for assistance and a suspect was detained shortly after. "Due to the nature of the injuries S/SGT Pope had to undergo surgery at Stoke Mandeville Hospital yesterday. He will be unable to carry out his day job or of course Police duties for a number of months. Everyone based at Aylesbury want to wish him a speedy recovery. "We stand together as one team." A fellow colleague described Chris as "a thoroughly nice bloke" and wished him well in his recovery. a Statement from TVP said: "Thames Valley Police is appealing for witnesses following a GBH incident in which a Special Sergeant was assaulted in Aylesbury. "The incident occurred on Saturday (23/9) on a footpath from Dunsham Lane to Alfred Rose Park at about 7.30pm. "A Special Sergeant was responding to a number of calls from members of the public who had reported concerns about a quad bike driving at speed in the area of Alfred Rose Park. "He attended the park and began walking along the footpath, and then saw the quadbike driving towards him. "The officer moved out of the way to let the bike pass, but it swerved towards him, hitting him in the leg. "He sustained a broken leg as a result of the incident, and was taken to hospital for treatment, where he remains at this time. 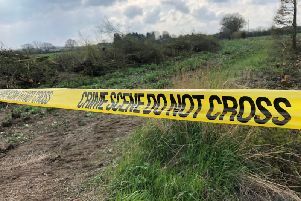 "Investigating officer Detective Constable Luke Pratt, of Aylesbury Force CID, said: "This is a very concerning incident in which it appears that a quad bike has been deliberately driven at an officer. "He has sustained a serious leg injury which has required him to have hospital treatment. "We have made two arrests in connection with this incident, but I would like to appeal for anyone who witnessed this incident, or who has any information relating to it to please call the Thames Valley Police non-emergency number on 101."